We’ve added another very useful document to our website – a comprehensive guide to Ferroli domestic boiler flues. This manual gives all the information that installers will need for working with Ferroli flues, including minimum clearances, standard flue applications, coaxial horizontal and vertical flues, 80mm two pipe flue applications, plume displacement kits and terminal positions. 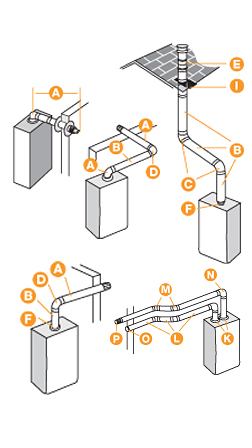 There’s also a very handy illustrated list of flue parts with the part numbers needed to order from merchants. Click here to see the Flue Manual.